Milk Protein, Milk Chocolate Flavoured Coating (14%) (Sweeteners (Isomalt, Sucralose), Sustainable Palm and Palm Kernel Oil, Whey Powder (Milk), Fat Reduced Cocoa Powder, Fortified Wheat Flour (Wheat Flour, Calcium Carbonate, Iron, Niacin, Thiamin), Emulsifiers (Soya Lecithin, E476), Flavouring)), Hydrolysed Collagen, Humectant (Glycerol), Caramel (10%) (Sweeteners (Maltitol, Maltitol Syrup), Humectant (Sorbitol), Water, Skimmed Milk Powder, Coconut Oil, Bamboo Fibre, Milk Fat, Natural Flavouring, Emulsifier (E471), Salt, Preservative (E202)), Protein Crisps (Soya Protein, Cocoa Powder, Tapioca Starch), Fructo-Oligosaccharides, Bulking Agent (Polydextrose), Inulin, Sweeteners (Maltitol, Sucralose), Flavouring, Rapeseed Oil, Salt, L-Carnitine, Fat Reduced Cocoa Powder, Antioxidant (Natural Mixed Tocopherols), Zinc Oxide. 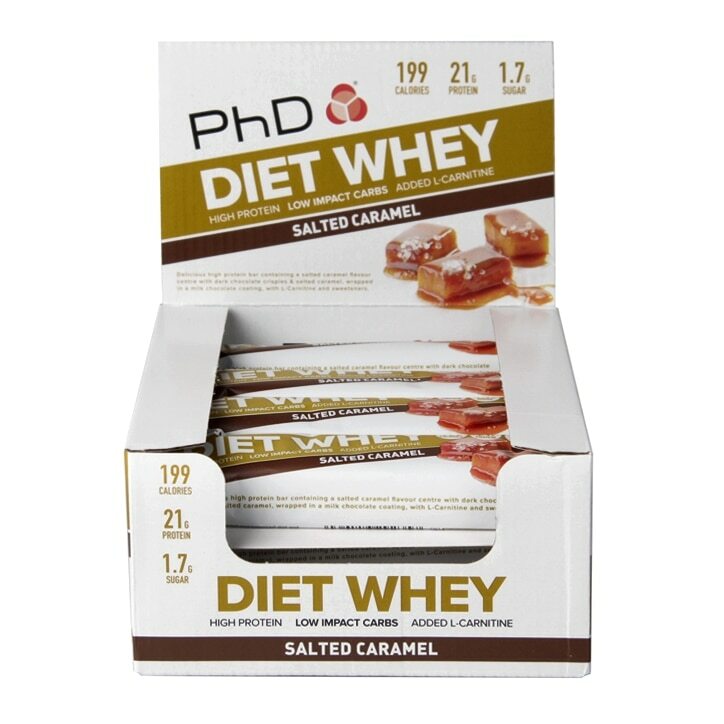 PhD Diet Whey Bar Salted Caramel is rated 4.5 out of 5 by 11. Rated 5 out of 5 by Clarks from Whey Bar Salted Caramel A good, healthy snack at tea time to treat yourself. Rated 5 out of 5 by Lynda 57 from Whey bar I tried these for the first time, so pleased I did. Will definately get some more. Lovely soft and full of flavour.